Estonia is located in eastern Europe. Estonia is bordered by the Baltic Sea, Gulf of Finland, Gilf of Riga, Russia to the east, and Latvia to the south. Google Earth is a free program from Google that allows you to explore satellite images showing the cities and landscapes of Estonia and all of Europe in fantastic detail. It works on your desktop computer, tablet, or mobile phone. The images in many areas are detailed enough that you can see houses, vehicles and even people on a city street. Google Earth is free and easy-to-use. Estonia is one of nearly 200 countries illustrated on our Blue Ocean Laminated Map of the World. This map shows a combination of political and physical features. It includes country boundaries, major cities, major mountains in shaded relief, ocean depth in blue color gradient, along with many other features. This is a great map for students, schools, offices and anywhere that a nice map of the world is needed for education, display or decor. If you are interested in Estonia and the geography of Europe our large laminated map of Europe might be just what you need. It is a large political map of Europe that also shows many of the continent's physical features in color or shaded relief. Major lakes, rivers,cities, roads, country boundaries, coastlines and surrounding islands are all shown on the map. Ahtme, Ambia, Elva, Emmaste, Haapsalu, Iisaku, Ikla, Jarve, Jogeva, Juuru, Kaina, Kella, Kihelkonna, Kirbia, Kohtla-Jarve, Koosa, Kopu, Kose, Kulli, Kuressaare, Meleski, Moniste, Mustla, Mustvee, Nomme, Nuia, Orlssaare, Parnu, Poltsamaa, Polva, Puhja, Rakvere, Rooslepa, Salme, Tallinn (Reval), Tartu, Torva, Turba, Turi, Valga, Viljandi, Virtsu, Vohma and Voru. Baltic Sea, Gulf of Finland, Gulf of Riga, Halliste Lake, Hara Laht, Irbe Strait, Kolga Laht, Lake Peipus (Chudskoye Ozero), Muhu Vain, Narva Laht, Parnu Laht, Pskovskoye Ozero, Soela Vain, Suur Vain and Vorts Jarv. The mineral resources for Estonia include phosphorite, dolomite, limestone, sand and clay, and the fuel resources include oil shale and peat. Other resources for the country include sea mud and arable land. 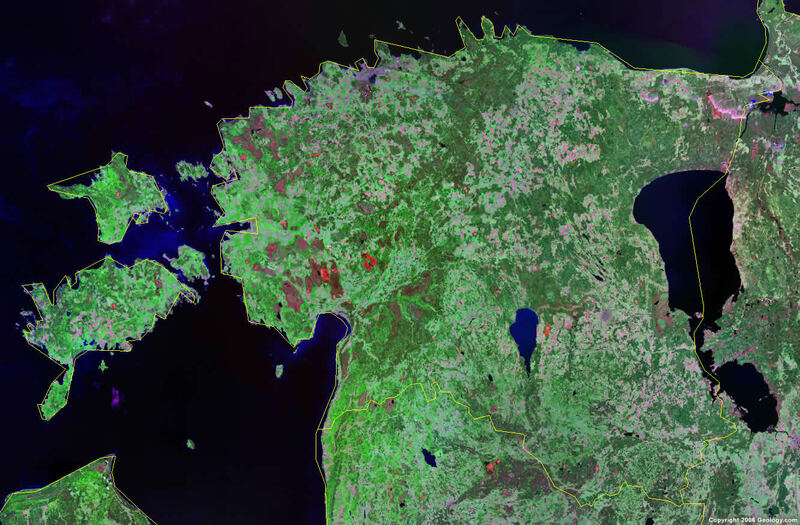 The country of Estonia is vulnerable to occasional flooding, which can occur in the spring. The country of Estonia has environmental issues concerning air and water. The air in the northeast is polluted with sulfur dioxide from oil-shale burning power plants. However, the amount of pollutants emitted to the air has fallen steadily, as the emissions of 2000 were 80% less than that of 1980. Estonia's coastal seawater is polluted in certain locations. In addition, the country has more than 1,400 natural and manmade lakes, of which the smaller (in agricultural areas) need to be monitored. However, in connection with the startup of new water purification plants, the pollution load of wastewater has decreased. The amount of unpurified wastewater discharged to water bodies in 2000 was one twentieth the level of 1980.